For retro gaming fans looking to build their collection in one easy step, Retro-Bit Europe has provided the perfect solution - Multi-Cartridges! Retro-Bit Europe has partnered up with legendary game publishers Data East and Jaleco to release new cartridges loaded with officially licensed popular games. Available in time for Christmas this December, each cartridge is compatible with the original SNES, NES and the Super Retro Trio Plus console. In addition, the range of cartridges are all PAL versions, fully compatible with official and third-party PAL consoles. Cartridges are accompanied with an exclusive button and sticker set along with a collectible retail box, full colour instruction manual and protective hard dust cover. 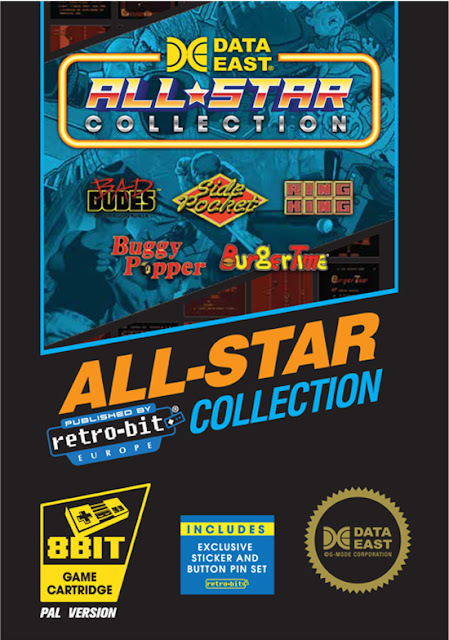 Enjoy some of the very best games from the Data East library with the All Star Collection cartridge. Published by Retro-Bit Europe for your NES or Super Retro Trio Plus consoles, this 5-in-1 cart compiles a must have list of retro classics. The Classic Collection from Data East brings you a brand new 5-in-1 cartridge for your original or 3rd party SNES console, as well as the Super Retro Trio Plus. Published by Retro-Bit Europe with the gamer in mind. Stop searching, sit back, and enjoy these classics on one cartridge. All 3 smash hits in 1 compilation for the first time! 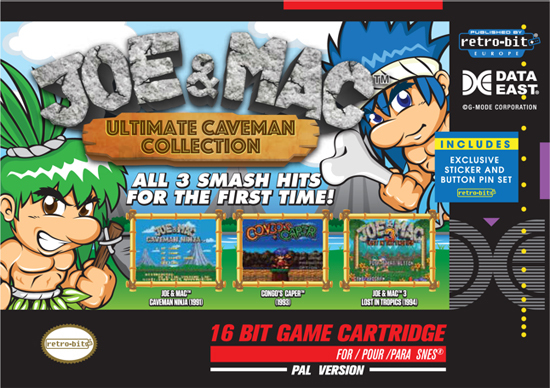 Includes all 3 Super Nintendo / Super Famicom Joe & Mac games - Joe & Mac: Caveman Ninja, Congo’s Caper (Joe & Mac Sequel) and Joe & Mac 3: Lost in the Tropics. Joe & Mac will bring you back in time! Relive the adventure as you travel every nostalgic level and battle enemies along the path. 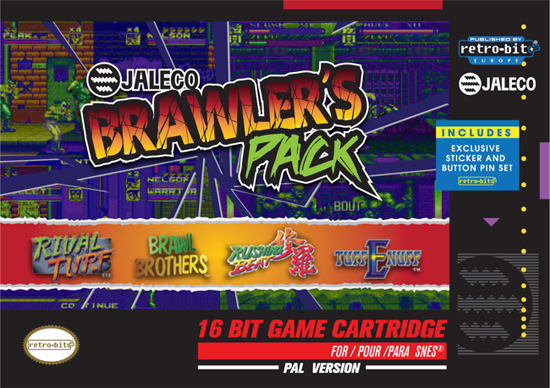 Test your might with the new Jaleco Brawler’s Pack, featuring 4 side scrolling beat-em-ups on one cartridge. Published by Retro-Bit Europe and compatible with all original or 3rd party SNES consoles, as well as the Super Retro Trio Plus. Ali Manzuri, Product Development Manager for Game Outlet commented, “We’ve been overwhelmed with the positive response from the announcement of the Super Retro Trio Plus console, designed specifically for European gamers. The new collection of Retro-Bit Europe multi-cartridges offer staggering value and instant retro action, unsurpassed by mere emulation and complete with exclusive collectibles that any retro gaming fan can appreciate. We are excited about this amazing collaboration with Data East and Jaleco and look forward to bringing these classics to Europe in time for the Holidays. The multi-cart collection compliments the entire retro-gaming experience. Retro-Bit Europe continues to make great strides to bridge the gap between gamers past and present. The new range of Multi Cartridges are available for pre-order today at Amazon.co.uk and from other leading retailers. A leader in the retro gaming community for more than a decade, Retro-Bit brings new life to classic video game consoles with exciting accessories and controllers. From the original Atari to the PlayStation and almost anything in between, Retro-Bit offers the best new ways to play old games.